If you are a lot owner in the Indio, California area then you might consider attending Marathon’s Twilight in the Desert event this February. 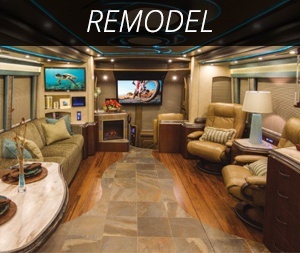 Of course we will have coaches on display, but this article is about refreshments. 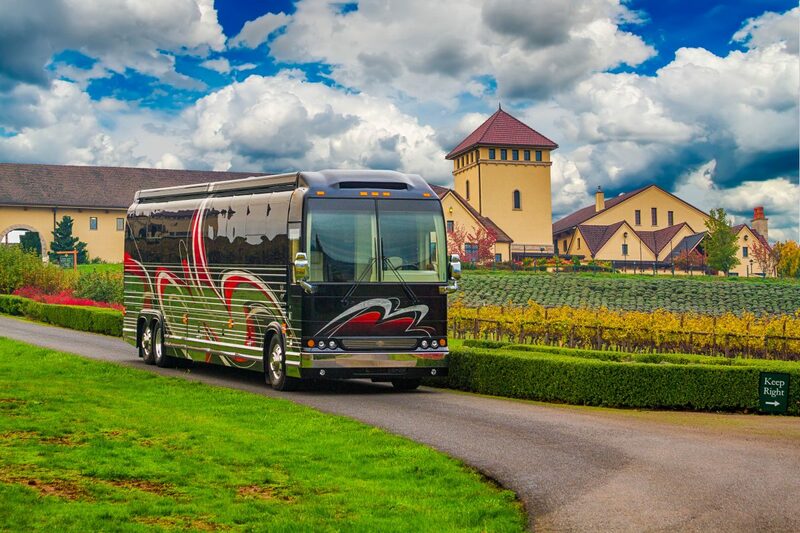 You see, we have decided to do an Oregon theme to our wines being poured at the event, offering a small tribute to the region that is home to the Marathon Coach factory. Oregon has gained a well deserved reputation for wine, especially where Pinot Gris, Pinot Noir, Chardonnay and Riesling are concerned. But we found a few surprises to bring as well. And yes, we did the tasting ourselves, so these choices are hand picked. The Marathon marketing department visited three of our favorite vineyards to make purchases for our upcoming event and discovered other grape varieties that are lesser known as Oregon wines, but were so exciting that we had to purchase some to share at the event. 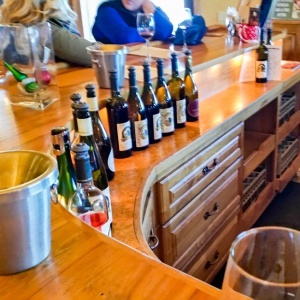 Most of the wines mentioned received high points with Wine Enthusiast Magazine. 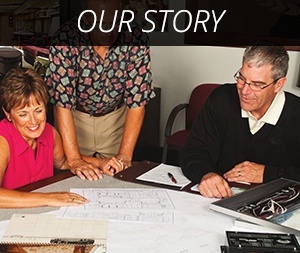 Let’s start with the Boss’s favorite Oregon winery, King Estate. Here we stayed traditional Oregon and picked up Pinot Gris, Pinot Noir and Chardonnay, all of which King is known for, and for good reason. We have not been able to confirm it, but it seemed to us that the wine sold at the winery is better that those purchased at a store under the same label. 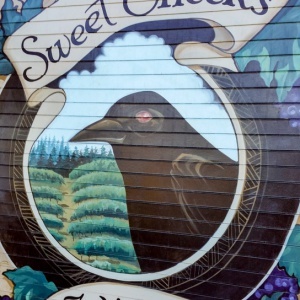 Miki recommended a stop at her favorite winery, Sweet Cheeks. Wanting an unbiased opinion, Miki wouldn’t tell me what her favorite wine was from this vintner until I tried them myself. I found several wonderful varieties, but their Riesling stood out as my top pick, and sure enough, it was Miki’s top pick as well. I purchased a case for those in Indio who like dry whites and you can judge for yourself. Also on both Miki’s and my list of favorites from Sweet Cheeks was their Rose. Rose didn’t used to be thought of as a finer wine, but attitudes have been changing the past couple of years and this dry Rose is a great example of why. Another enjoyable wine from Sweet Cheeks is their Blanc de Noirs. This is a red wine grape that has gently been pressed to get a white wine, and on top of that it is a sparkling wine. I also purchased a Blanc de Noirs from J Scott Cellars, but their version is flat instead of sparkling. Give them both a try to see how each vintner has interpreted a Blanc de Noirs. And now my favorite boutique vintner, J Scott Cellars. J Scott produces a larger variety of wines than I expected from a small boutique. Jonathon, owner and winemaker, took the time to share the unique processes involved with different wines as well as where in Oregon each grape variety was grown, including varieties that I did not know were grown in Oregon, such as Roussanne and Zinfandel. Let’s start with Oregon’s basics. 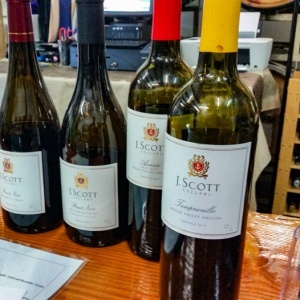 Scott’s Bradshaw Pinot Noir scored 91points with Wine Enthusiast and we cleaned out a case at our November, Indio open house to great reviews. His Pinot Blanc (87 points) has won three gold medals. I have two personal favorites for Scott’s white wines, the Roussanne and Siren’s Song. The Roussanne (also a gold medal winner) is an incredible dry white with gentle aromatics and very easy to drink. Next on the list is a blend called Siren’s Song, created with a mix of Riesling and Gewurztraminer, which is slightly sweeter and more aromatic than the Roussanne. My father, whose palate cannot handle drinking reds due to surgery, fell in love with this wine and bought a bottle for himself and my mother. His hope being that he wouldn’t have to share his bottle if she had one of her own. 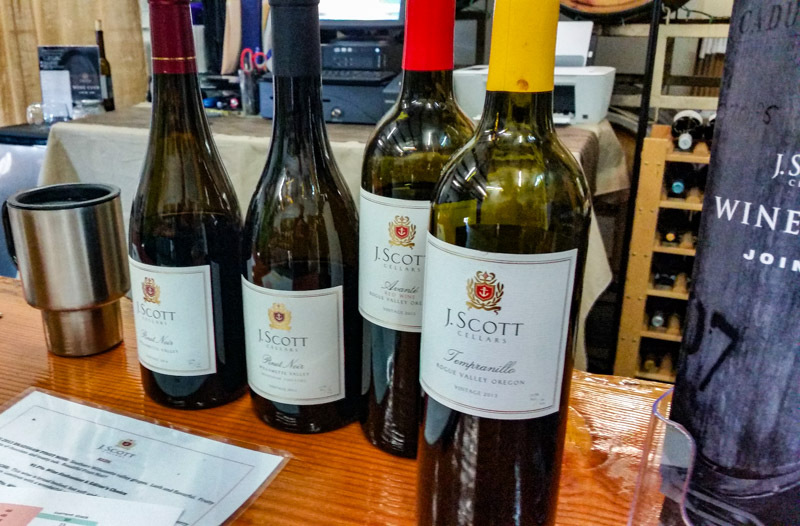 J Scott produces many varieties of highly rated reds, but I prefer the Petite Syrah (89 points and three gold medals). Red isn’t exactly the right word used to describe the sight of this wine as it is almost black. Ask for a glass at the Indio event and offer your opinion. For flavor, this is the most rounded red I tasted. (Note: I promptly purchased a bottle of my own). Jonathon’s Petite Syrah doesn’t have overly aggressive acid or tannins that hit you from the first sip, but rather starts smooth and finishes smooth. 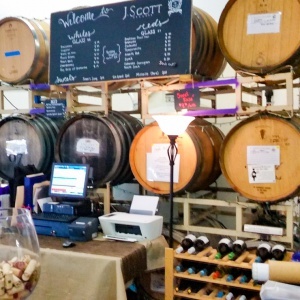 A few bottles of desert wines from J Scott will make their way south for those with a sweeter disposition. Keep an eye open for J Scott’s Vin Glace (ice wine). The unique process for creating this white desert wine leaves it higher in sugar without being too high in alcohol. And I can’t finish this without mentioning J Scott’s Mistelle. This is a wonderful Port wine that is sweet, rich and complex and a must-have around chocolate. My wife and I walked out of J Scott with both the Mistelle and Vin Glace and will no doubt be back for more.